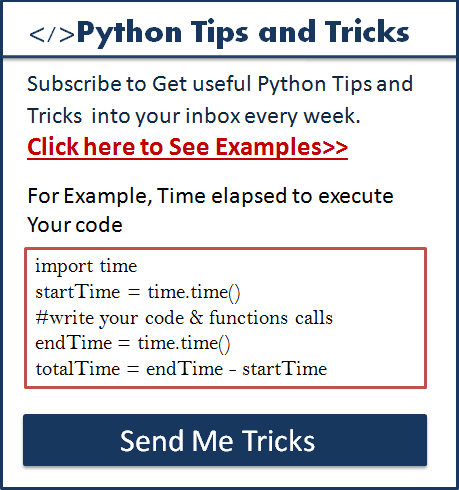 Improve your Python with our efficient tips and tricks. 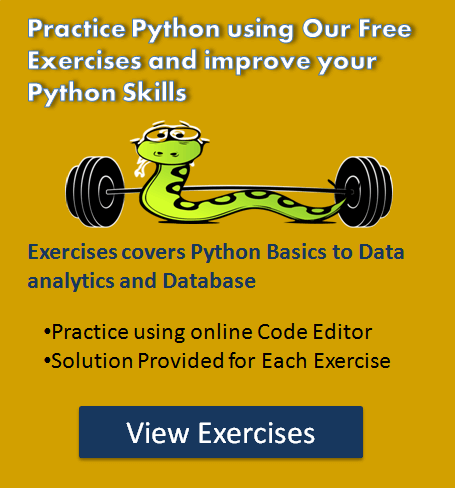 Following are the tips every Python programmer should know. Let’s say you want to calculate the time taken to complete the execution of your code. Using a time module, You can calculate the time taken to execute your code. Let’s say you have the following two lists. If you want to create a third list items from the first list which aren’t present in the second list. So you want output like this list3 = [ 'Emma', 'Smith]. Let see the best way to do this without looping and checking. To get all the differences you have to use the set’s symmetric_difference operation. whenever you use any data structure(such as a list or dictionary or any object) to store values or records. It is good practice to check how much memory your data structure uses. Use the sys.getsizeof function defined in the sys module to get the memory used by built-in objects. sys.getsizeof(object[, default]) return the size of an object in bytes. Note: The sys.getsizeof doesn’t return the correct value for third-party objects or user defines objects. Most of the time we wanted to remove or find the duplicate item from the list. Let see how to delete duplicate from a list. The best approach is to convert a list into a set. Sets are unordered data-structure of unique values and don’t allow copies. Count the occurrence of a first element. If it is same as the length of a list then it is clear that all elements are same. Above two lists contains the same element only their order is different. Let see how we can find two lists are identical. We can use collections.Counter method if our object is hashable. We can use sorted()if objects are orderable. Let say you want to check if the list contains all unique elements or not. To convert byte to string we can decode the bytes object to produce a string. You can decode in the charset you want. Use enumerate() function when you want to access list element and also want to keep track of the list items’ indices. For example, let say you have the following two dictionaries. And you want these two dictionaries merged. Let see how to do this. Let say you have two lists, and one list contains keys and second contains values. Let see how can we convert those two lists into a single dictionary. Using the zip function, we can do this. Let say you want to display any float number with 2 decimal places. For example 73.4 as 73.40 and 288.5400 as 88.54. This solution is handy when you have a sizeable numpy array.